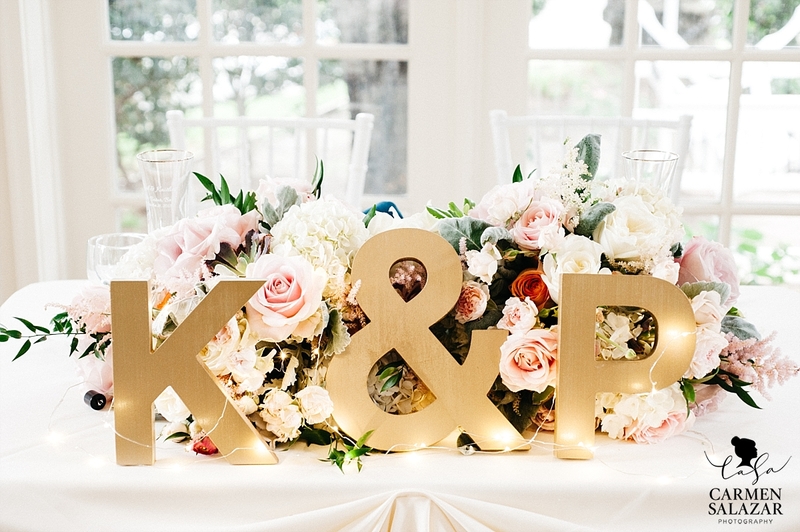 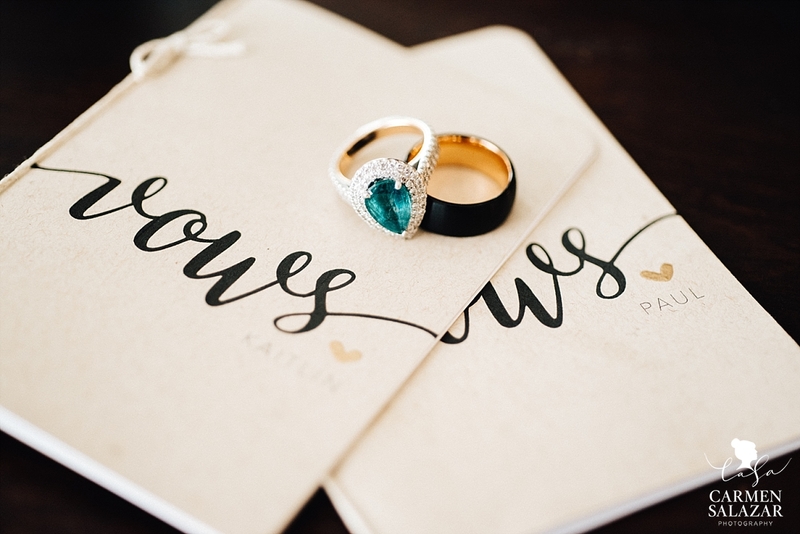 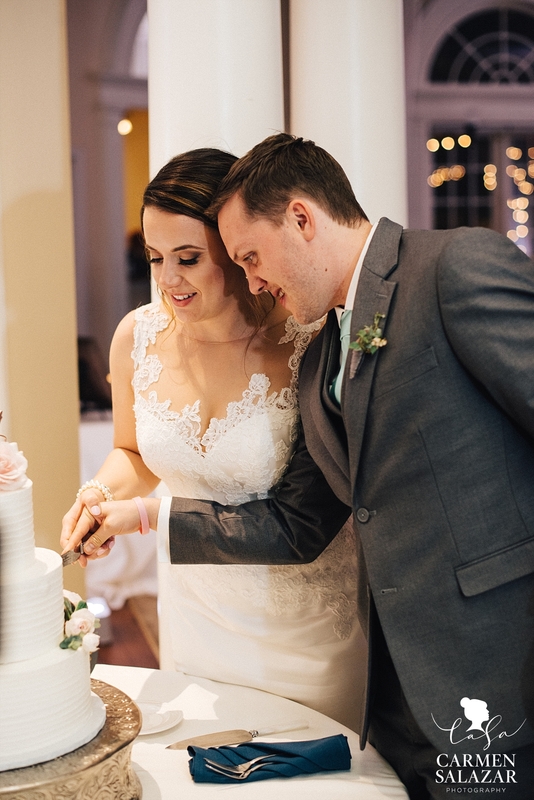 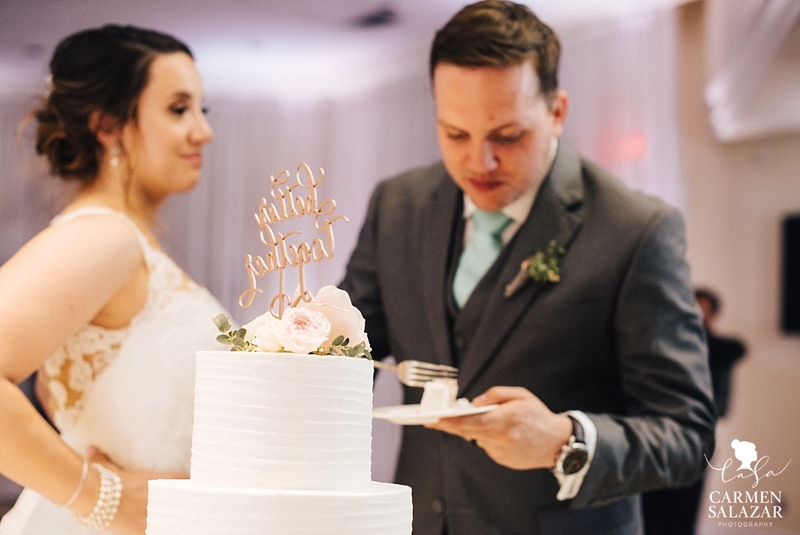 When I think of soulmates — Kaitlin and Paul truly take the cake! 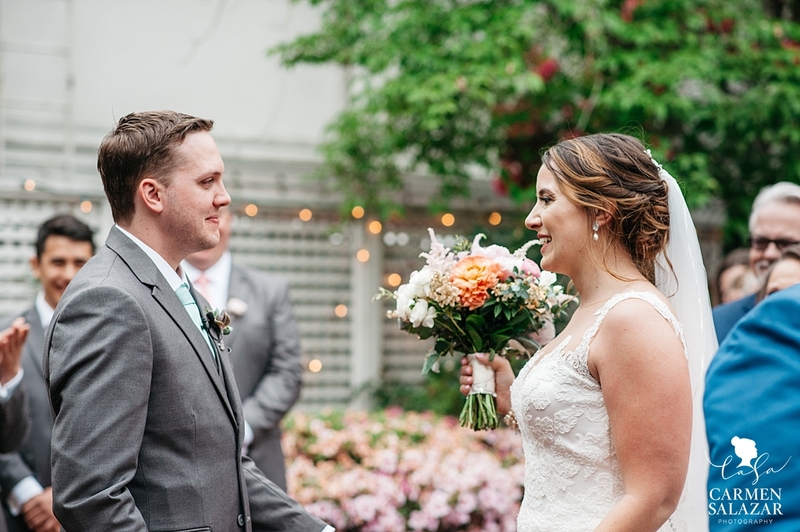 From their love of family to their vows to always making the other laugh, these lovebirds had us in happy tears all day long. 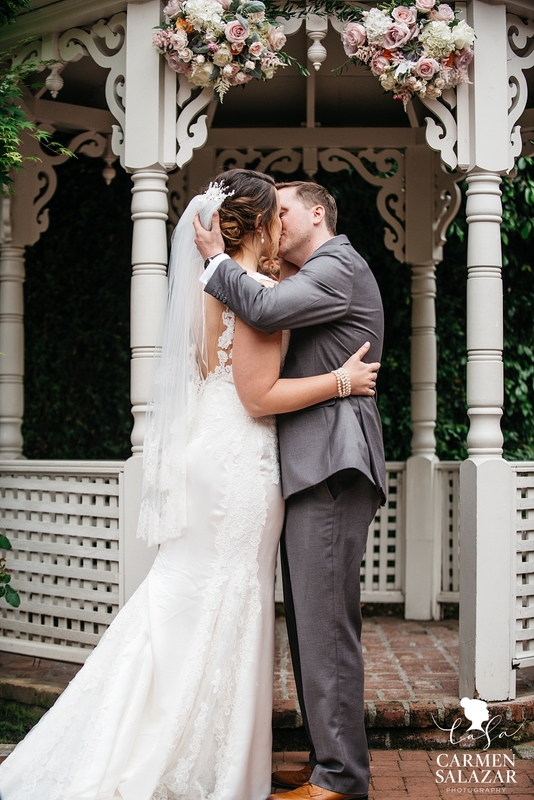 After capturing their Lake Merritt engagement session, I knew that their wedding would truly be one to remember. 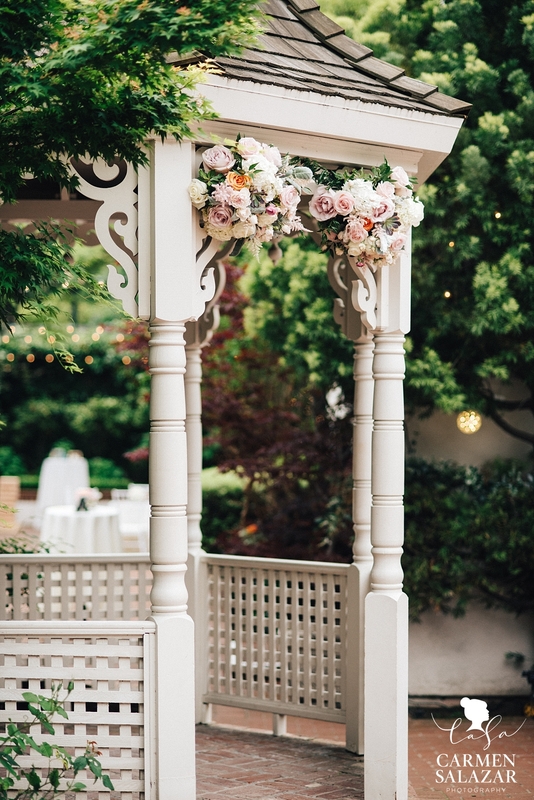 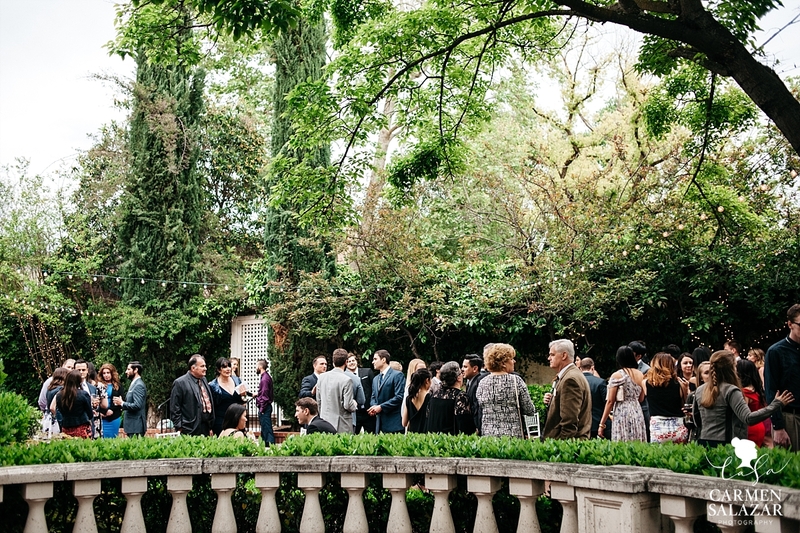 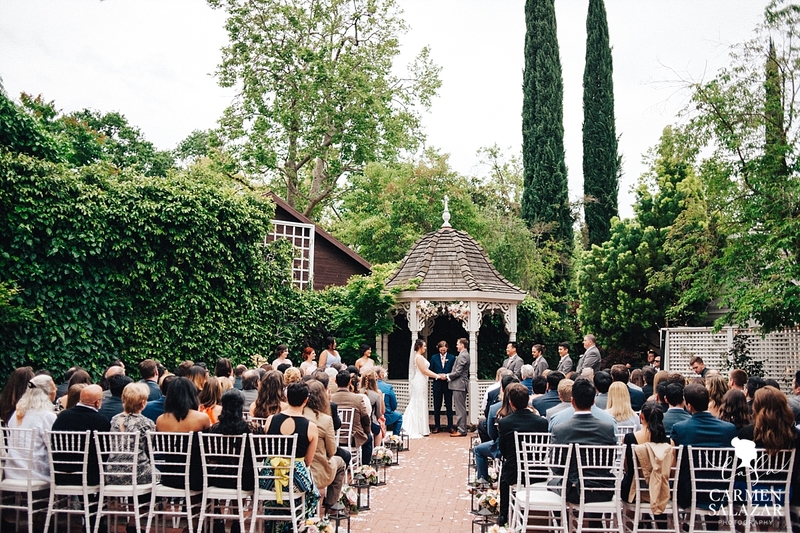 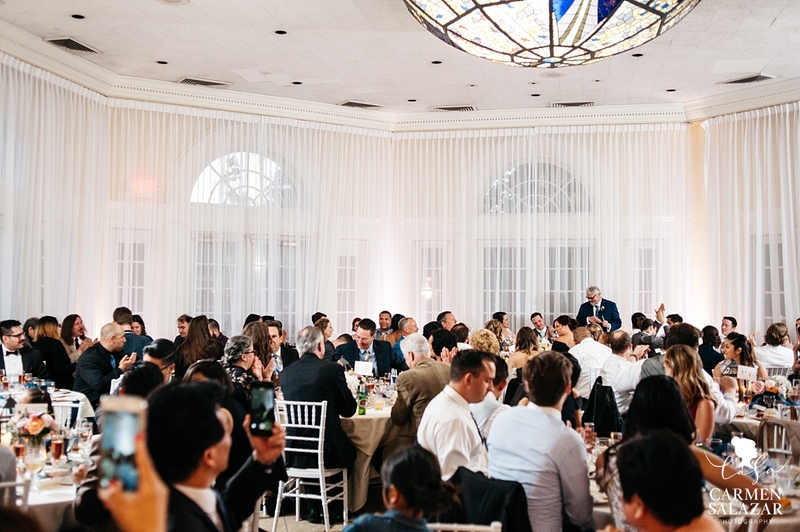 What better venue to celebrate this California love story, than at Vizcaya! 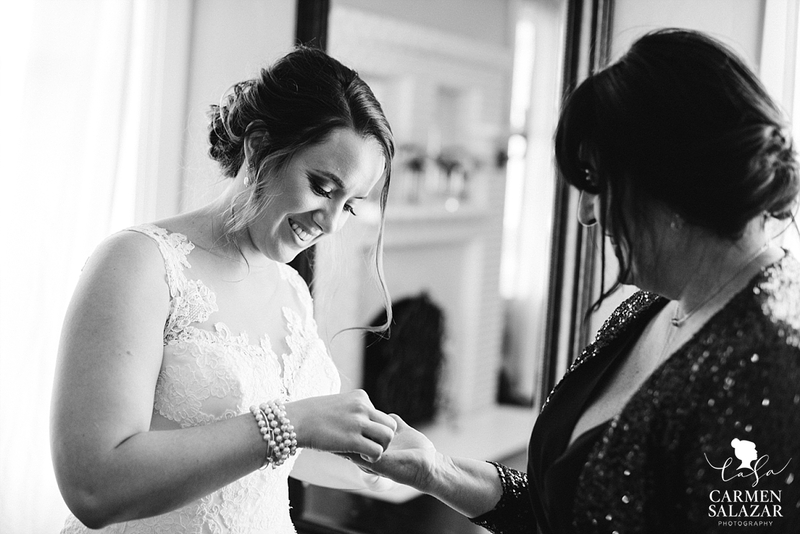 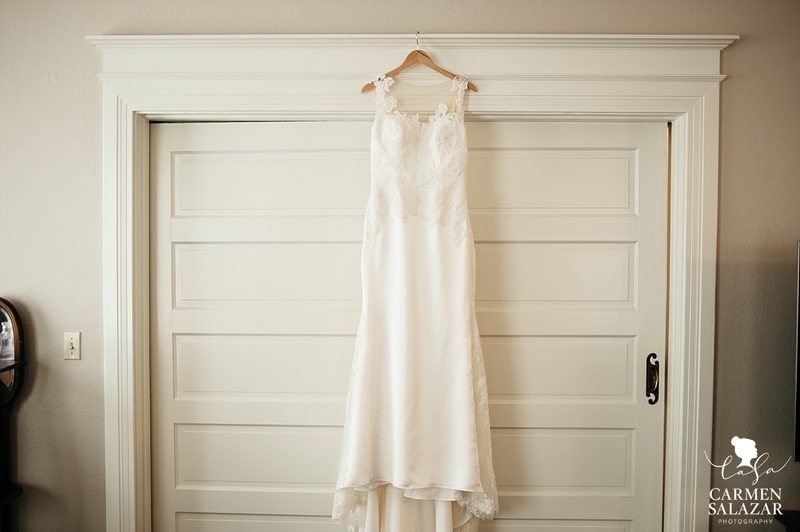 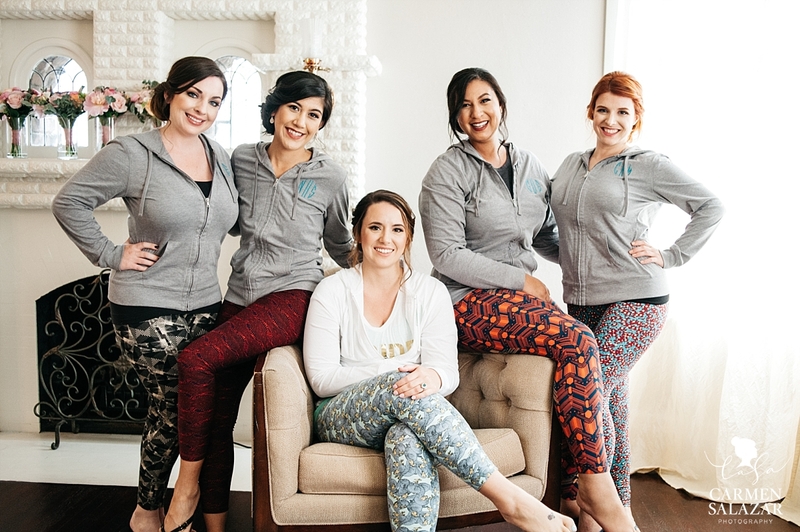 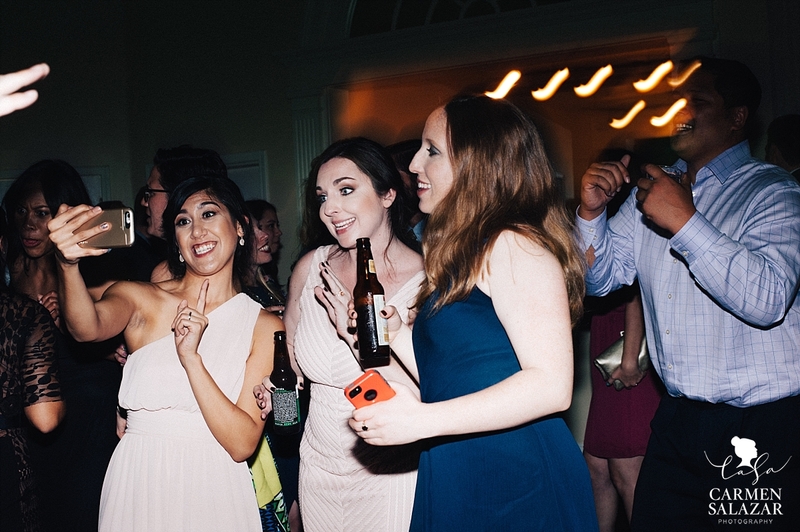 Our bridesmaids loved getting ready in the mansion’s gorgeous living room — and were ready to party the night away. 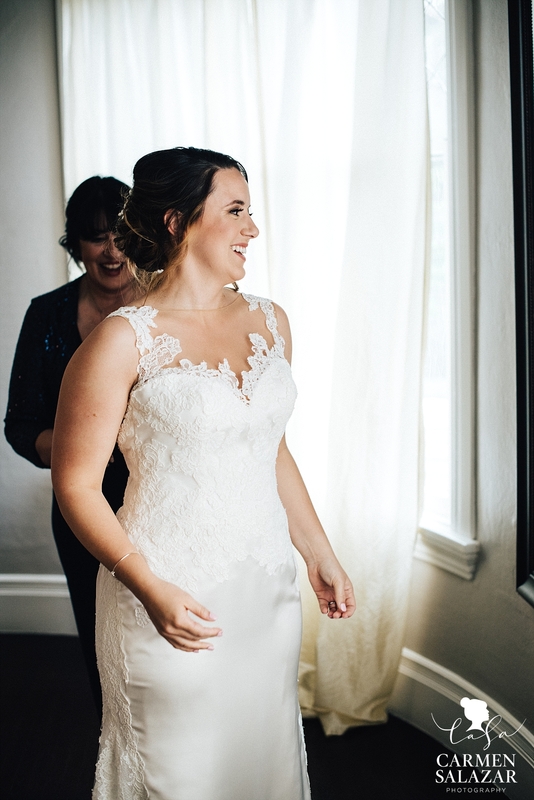 I’m a sucker for lace dresses and family tradition — so I just adored the coin pouch that Kaitlin’s mother sewed into her gown. 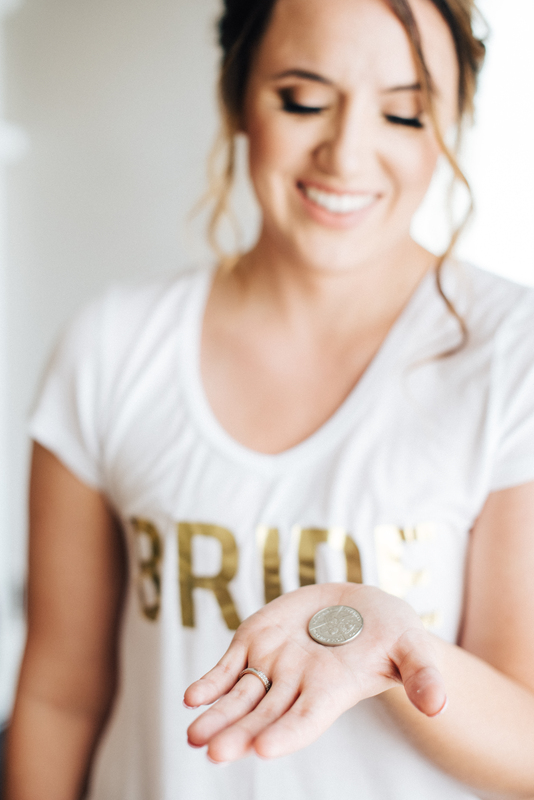 The pouch was made from her mother’s wedding gown, to carry the lucky coin her father gave her when she left home for college. 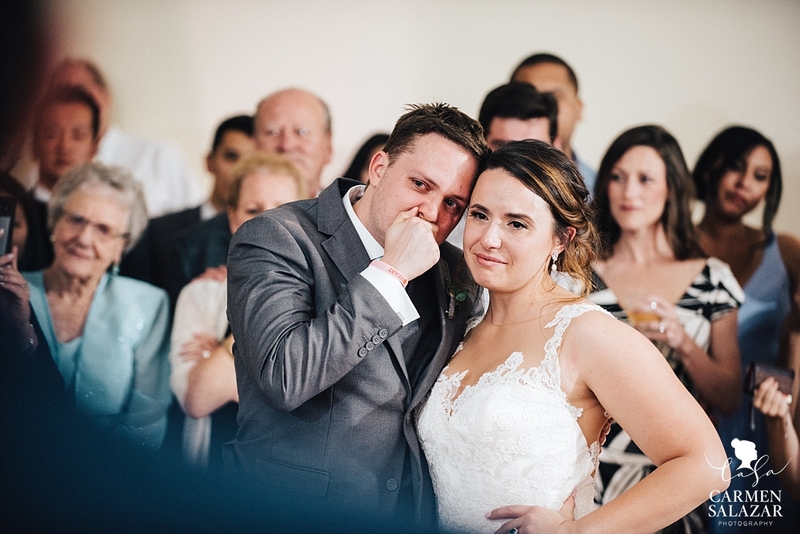 Ummmm….cue the tears…this had be bawling. 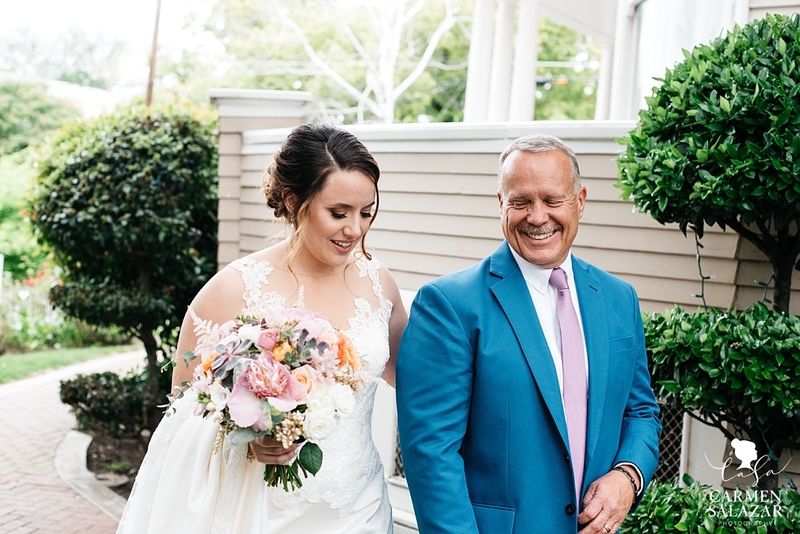 While her father’s coin carried her to college, the family tradition continued to bless Kaitlin and Paul on their big day. 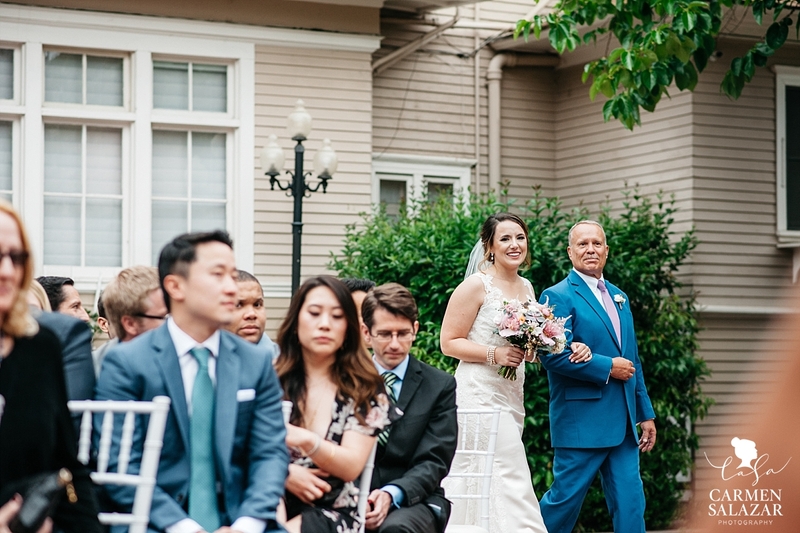 The first time that Paul saw Kaitlin, his jaw literally dropped. 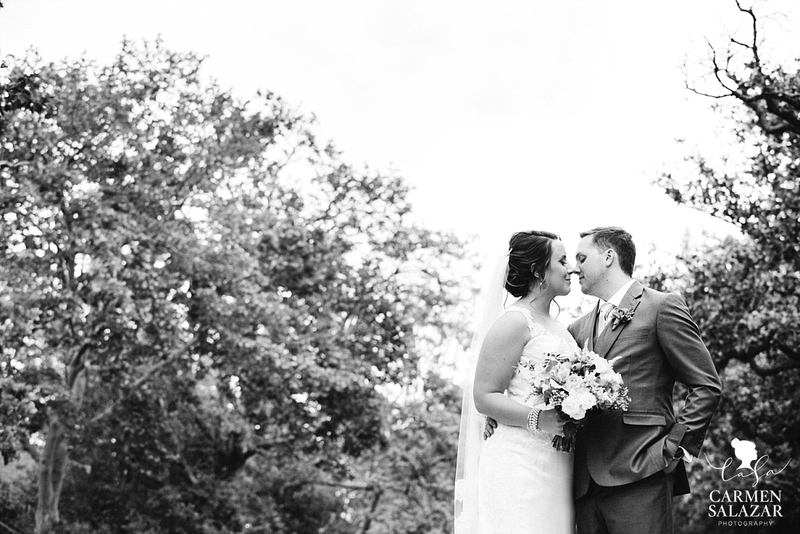 He never could have imagined that the dream girl who walked into his ambulance training class, would one day become his dream wife! 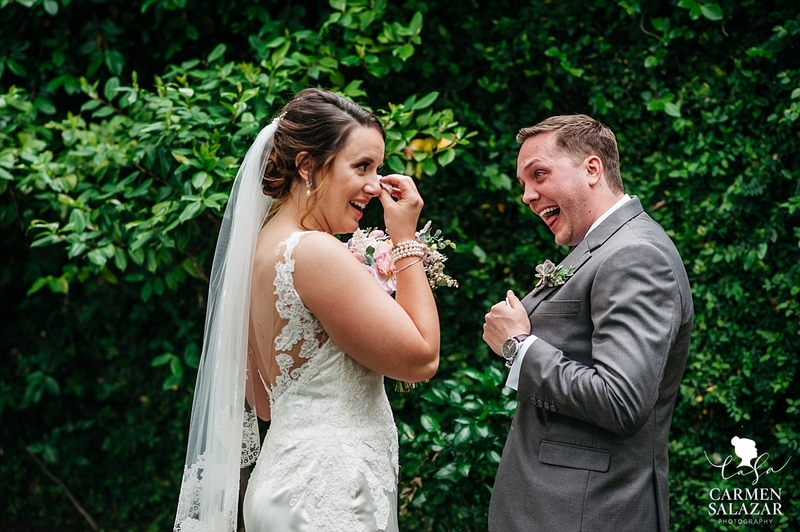 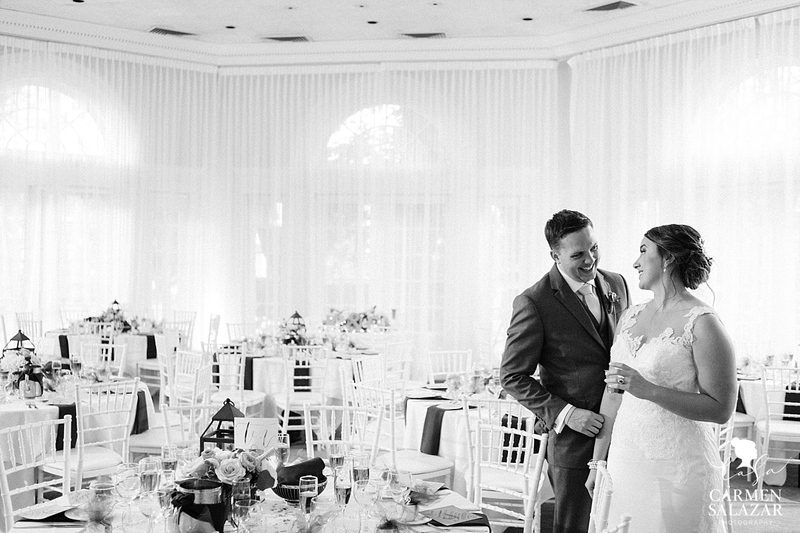 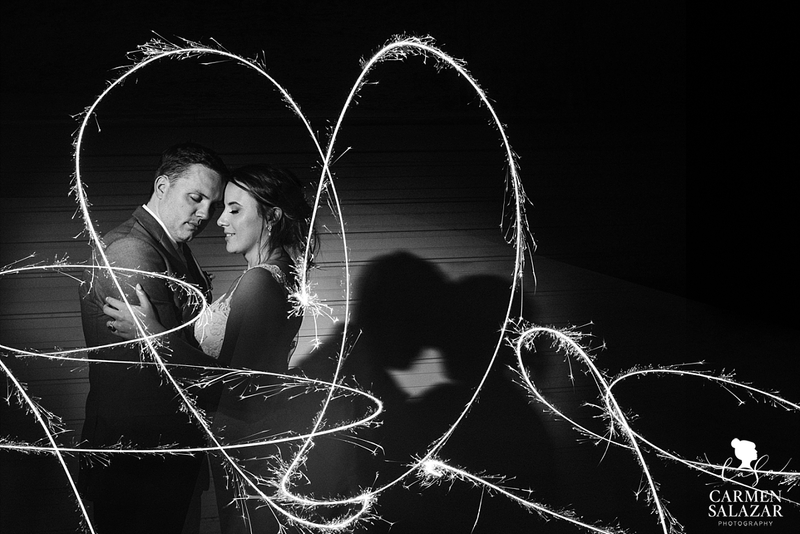 We knew the bride and groom were made for each other when they told us their favorite thing about each other. 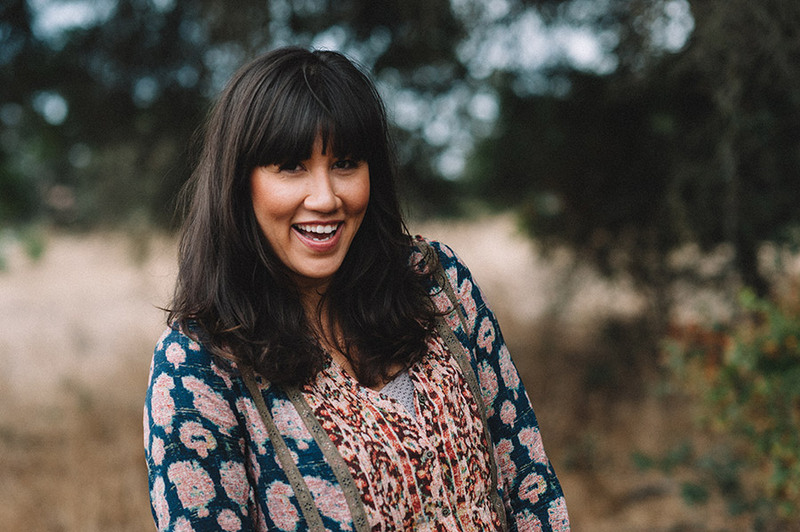 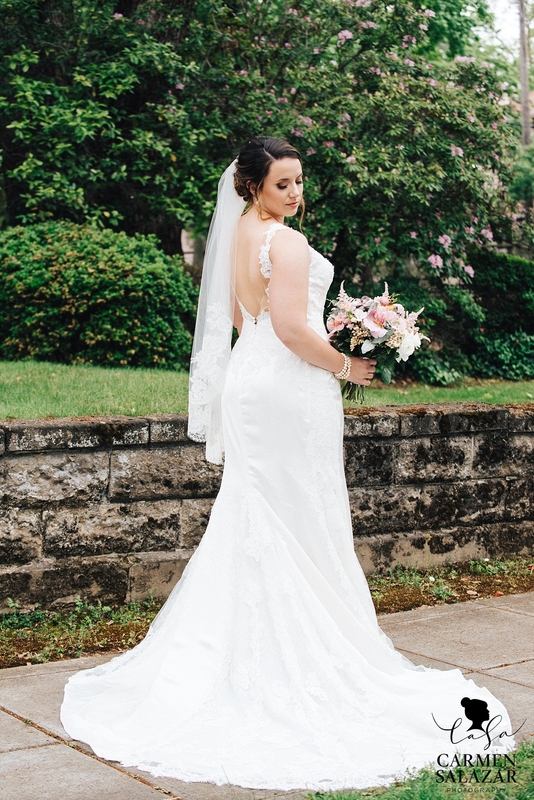 Paul told us it was her passion for family and loving nature; Kaitlin knew he was the one because “he will do absolutely everything for family”. 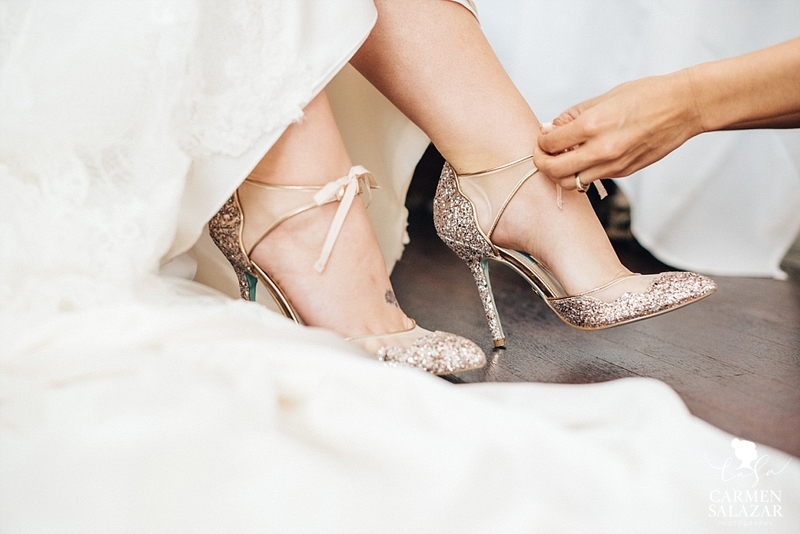 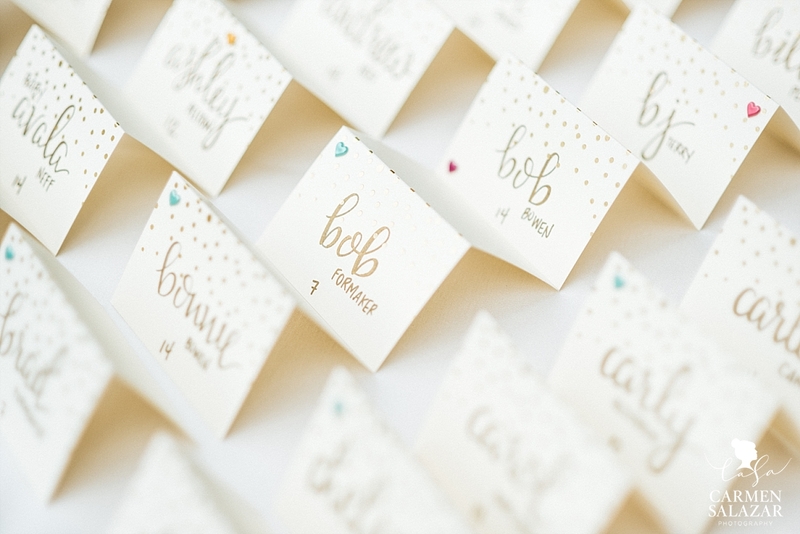 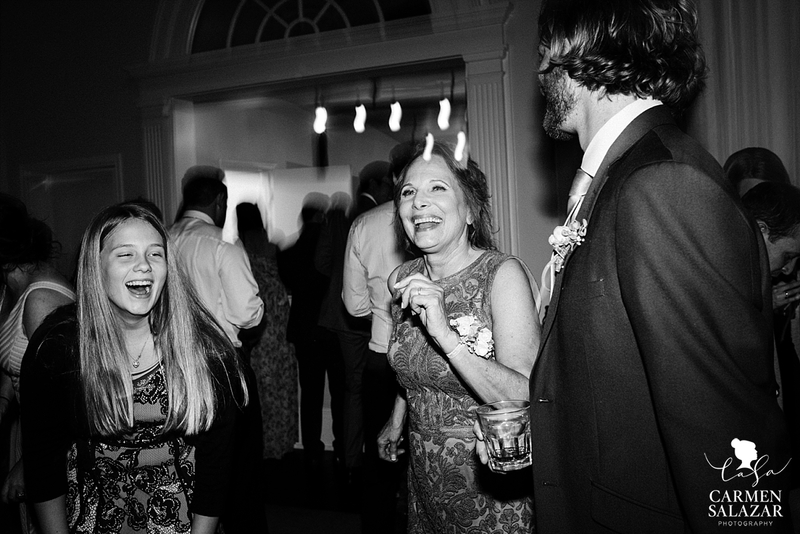 If anything was in abundance in their wedding – the love and support of family was number one. 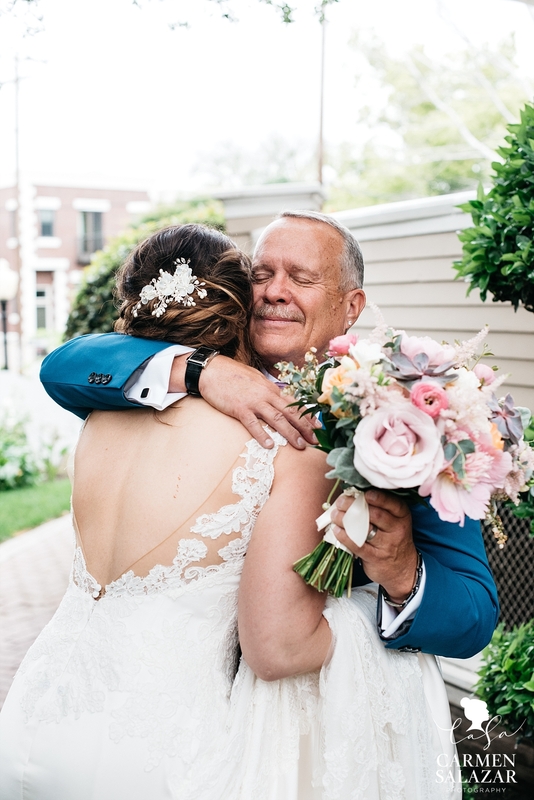 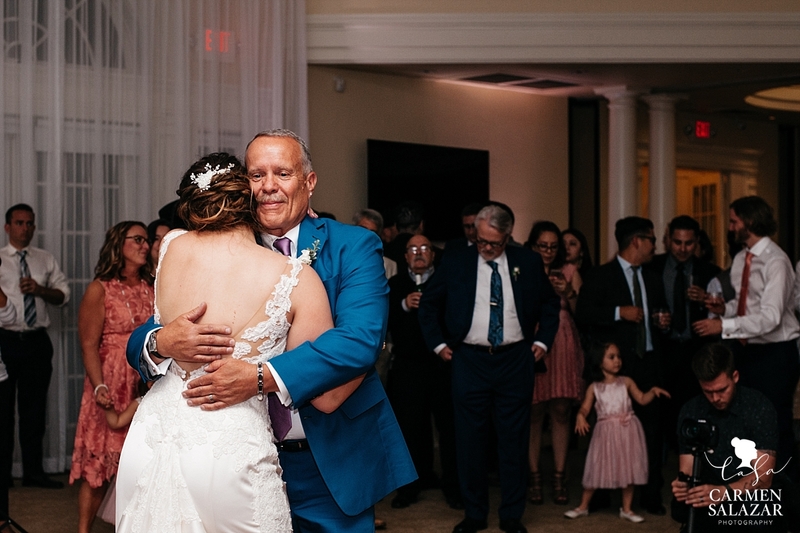 Kaitlin’s first look with her father was the beginning of many more tender family moments that day. 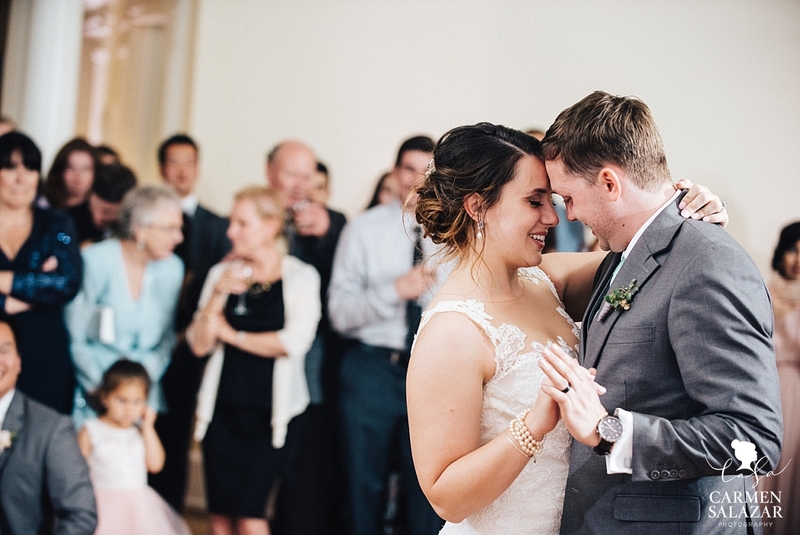 Kaitlin and Paul’s love song is Kaskade’s “Eyes” because she fell in love with his baby blues. 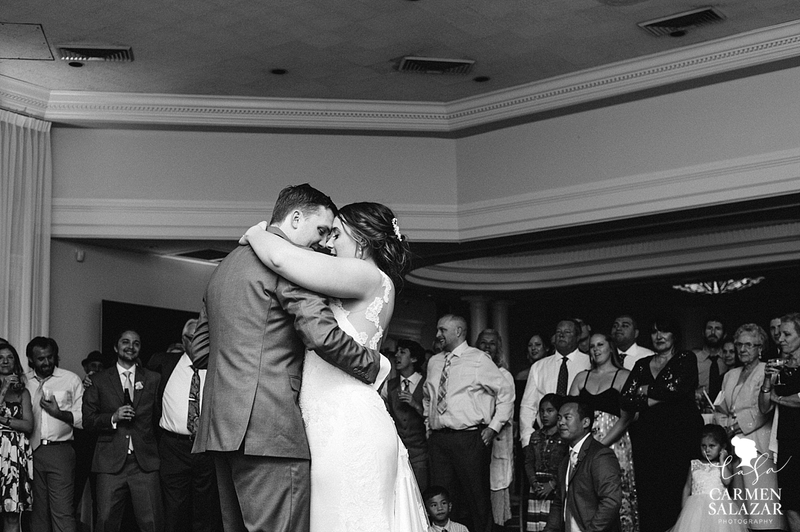 Little did they know their first dance would have a very different, surprise arrangement that night! 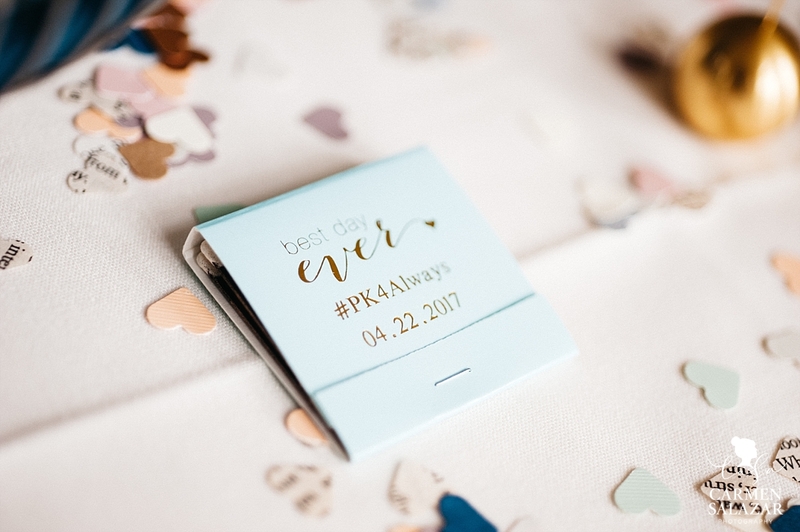 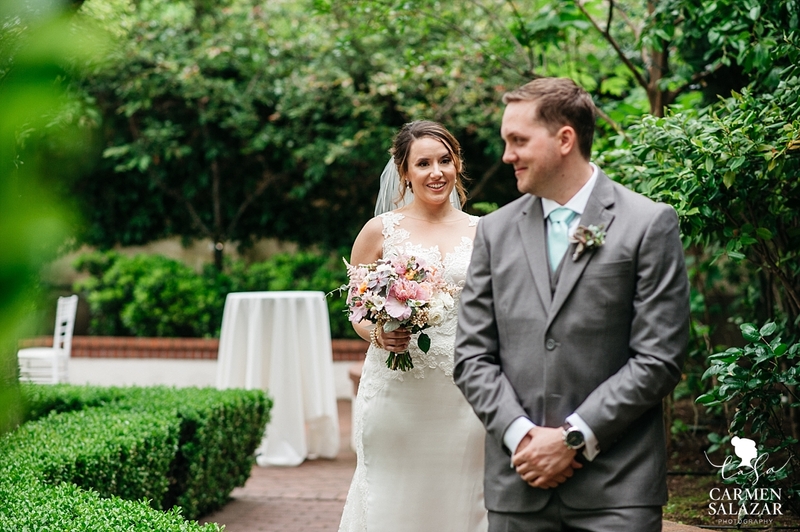 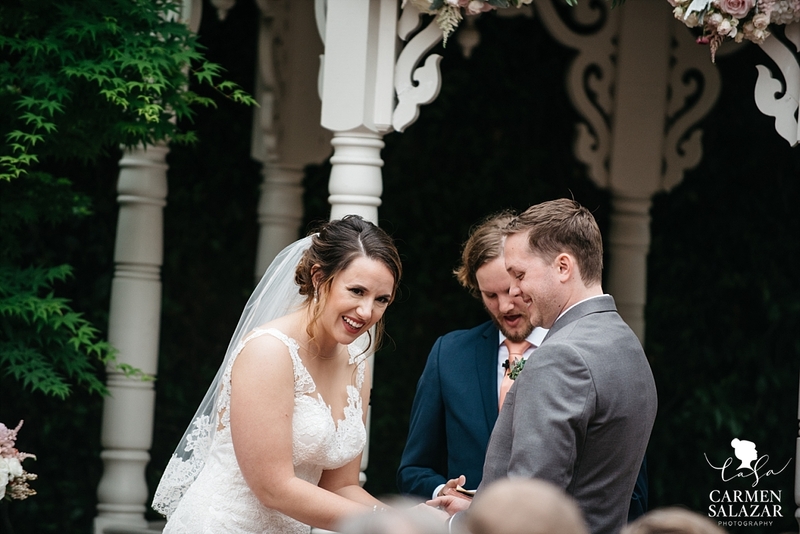 The couple was so excited to have Paul’s brother officiate their ceremony — family first meant that they wanted someone who truly knew their love to bring them into the new journey of marriage. 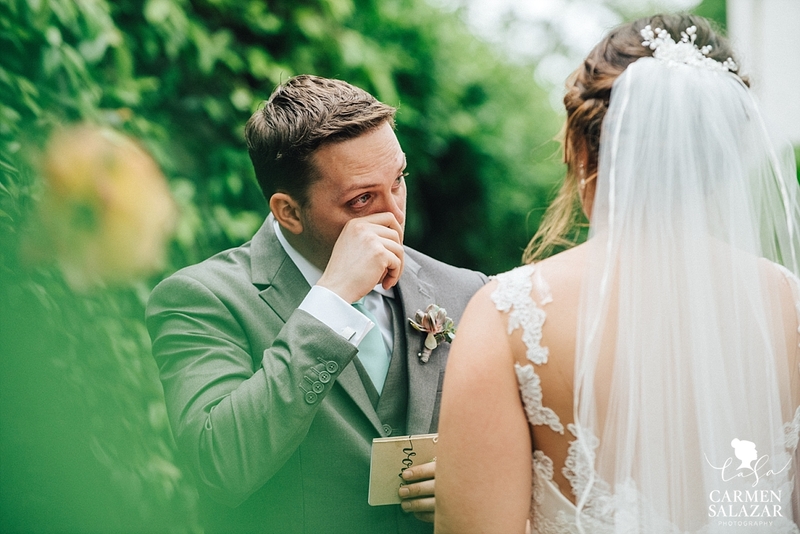 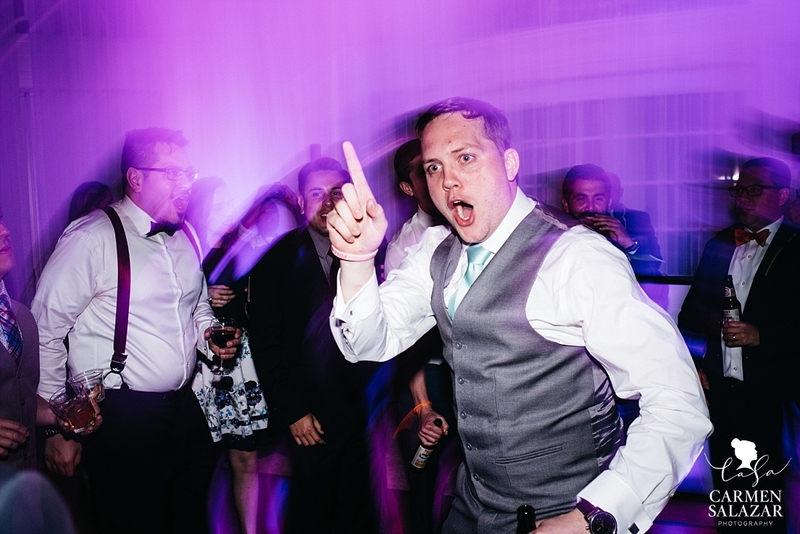 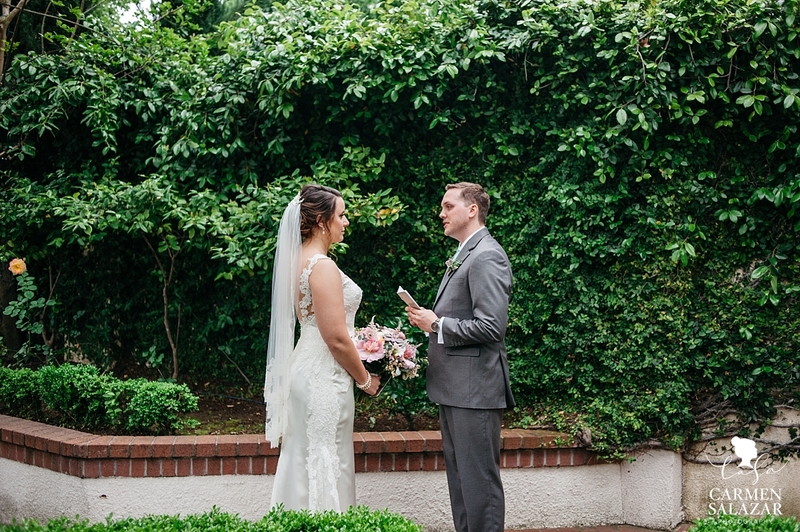 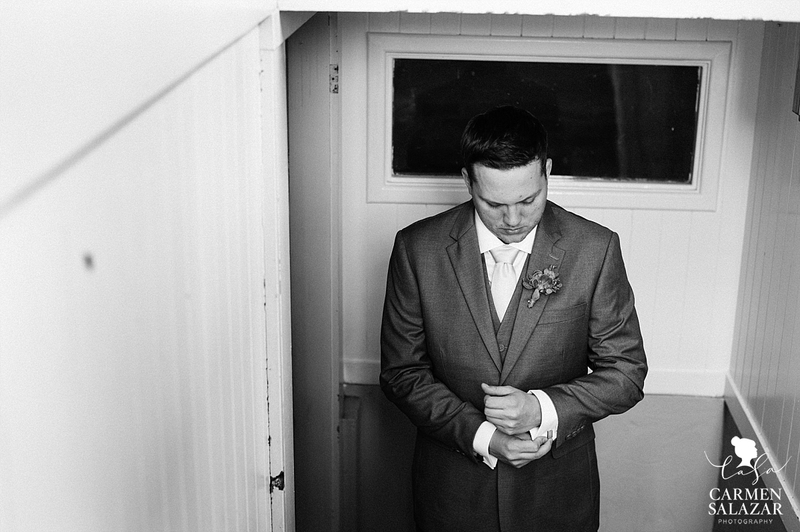 … and he did an amazing, emotional job officiating! 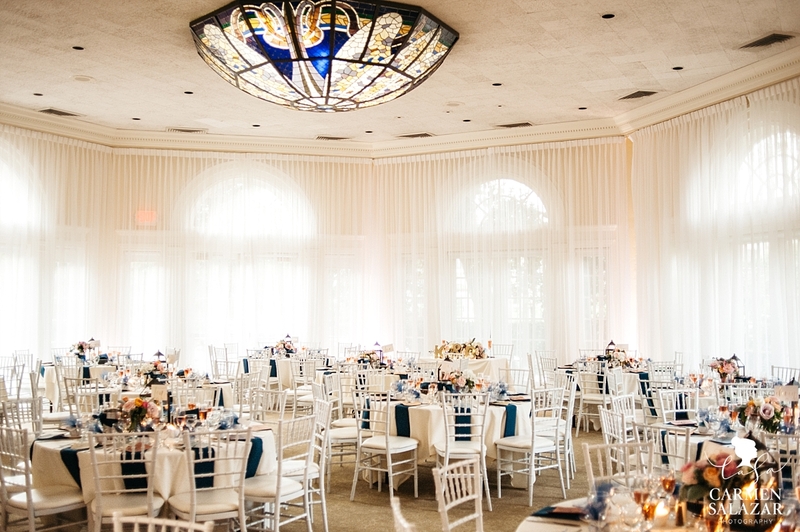 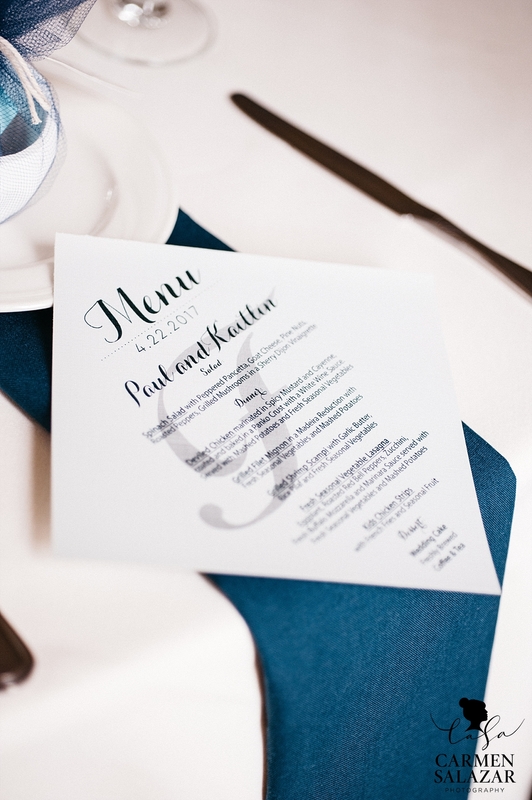 As per usual, Vizcaya’s girls did not disappoint in designing an elegant yet fun reception for Paul and Kaitlin. 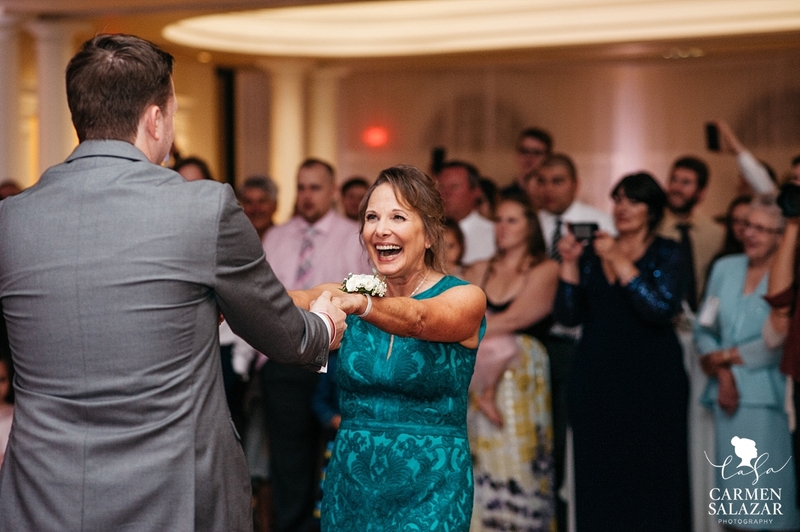 Kaitlin’s parents welcomed the wedding reception with a tear-jerking speech; complete with momma’s photographic aids to paint the picture of their daughter and their love for her. 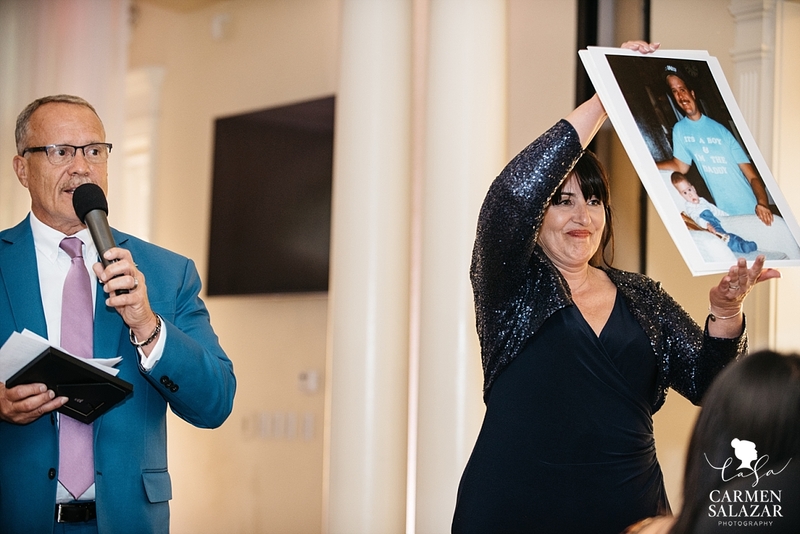 She put Vanna White to shame! 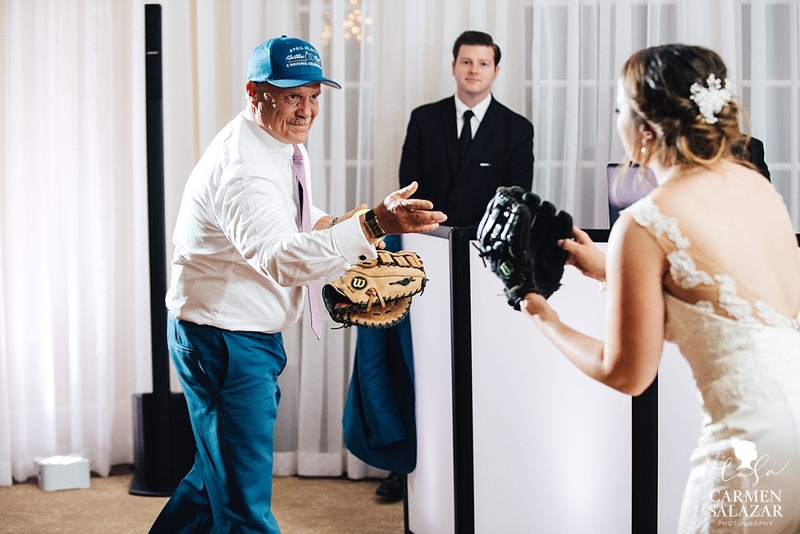 Just when we thought the waterworks were over — Kaitlin’s dad paused their father/daughter dance to pull out his mitt to play a game of catch with his baby girl. 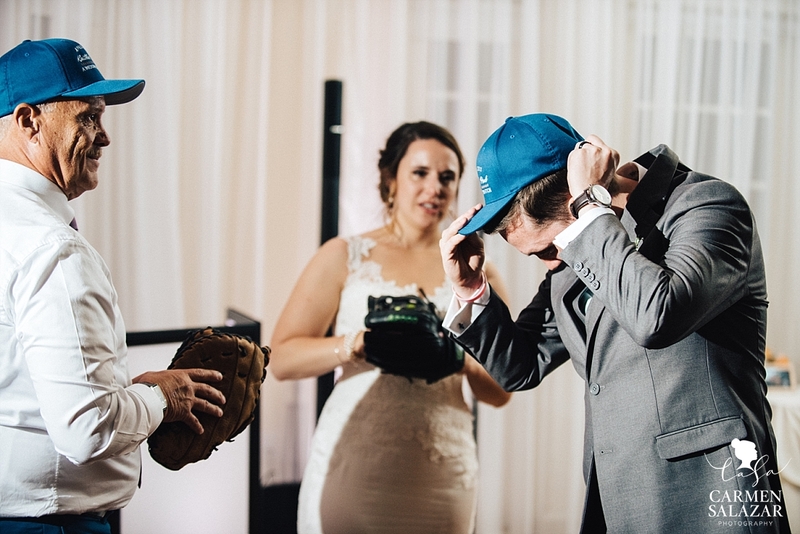 He told me beforehand that he wanted to use Kaitlin’s favorite game to create a rite of passage for her husband. 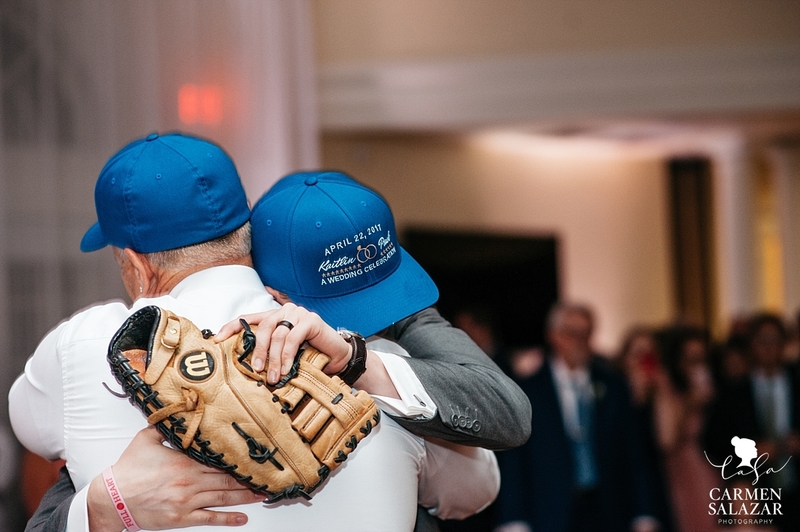 Passing a cap and ball to Paul meant that he is not only part of their family, but that he’s part of Kaitlin’s team too. 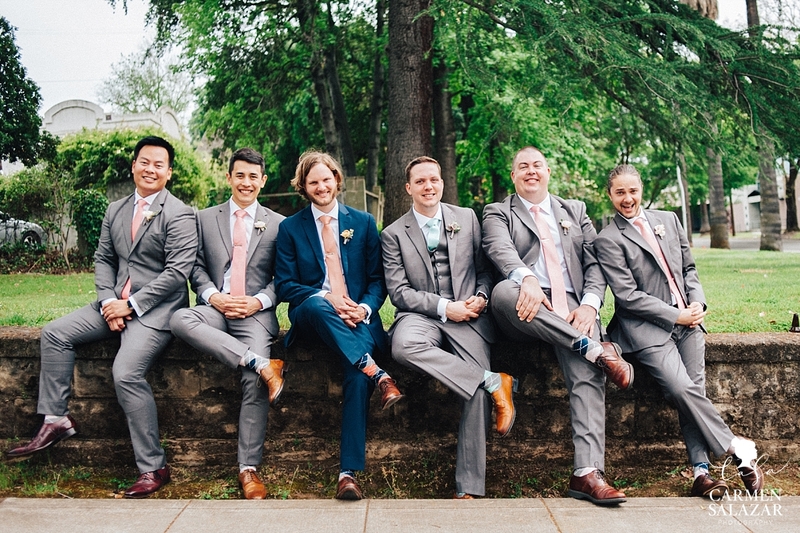 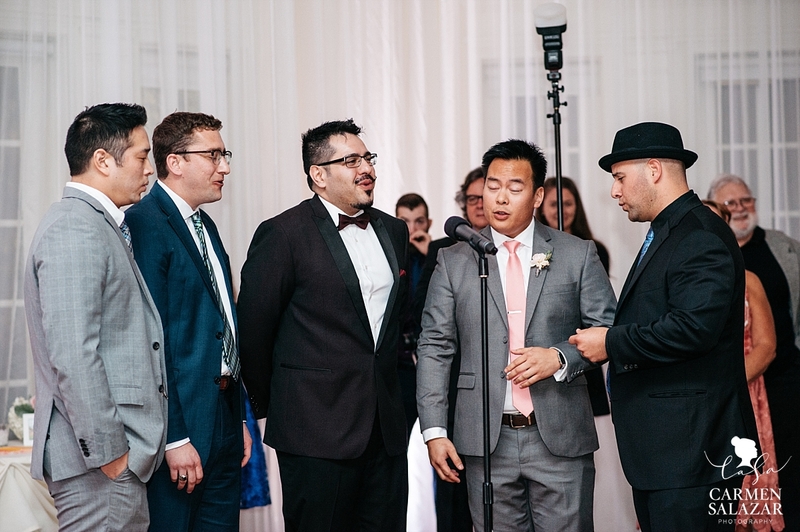 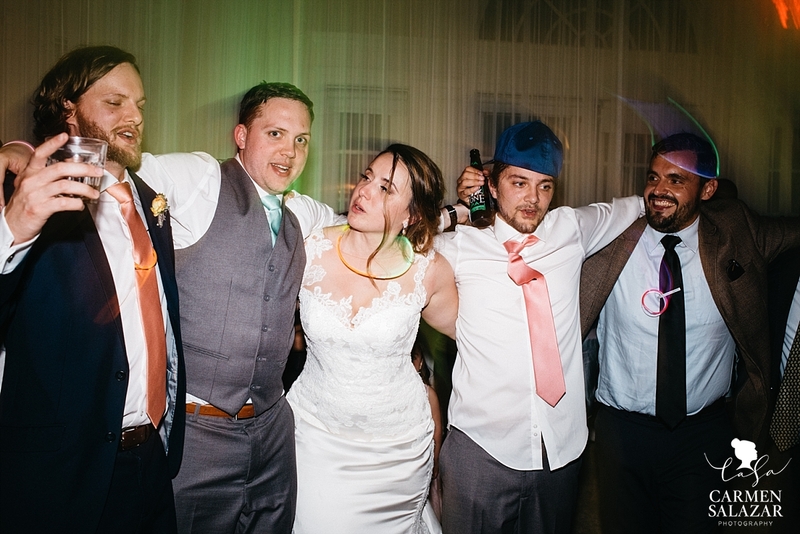 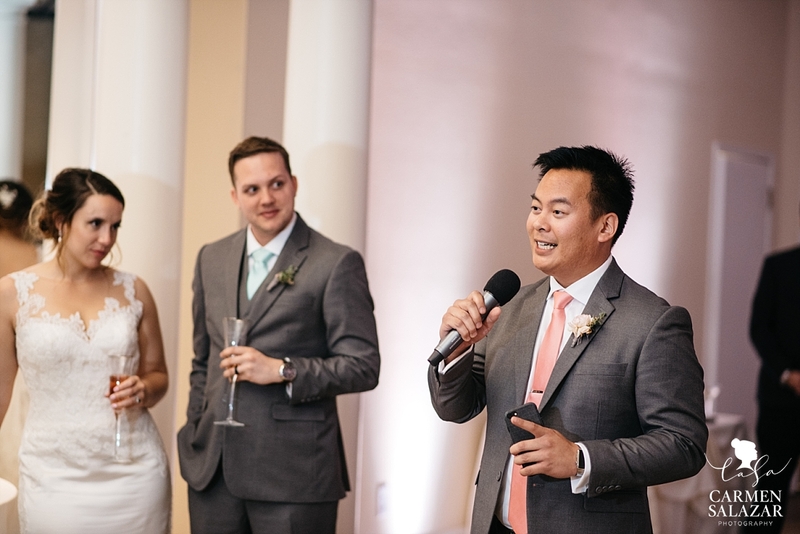 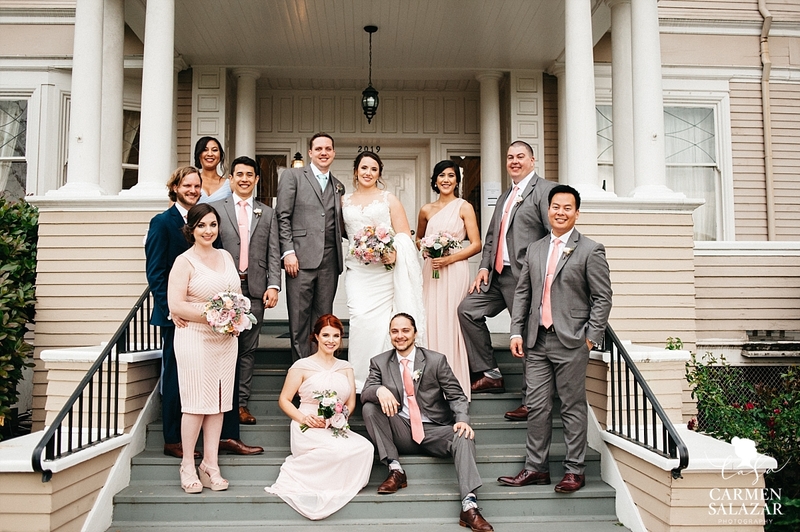 Paul planned to surprise his mother with a serenade by his college acapella group, but he had no idea that they had created a romantic arrangement to sing for the newlyweds. 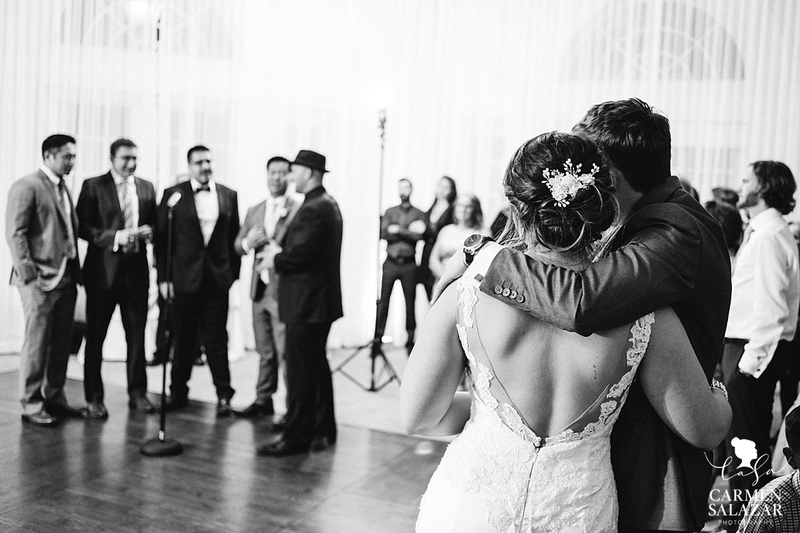 The intro to Kaitlin and Paul’s first dance was surrounded by song and dance from their closest friends and family — not a dry eye in the room. 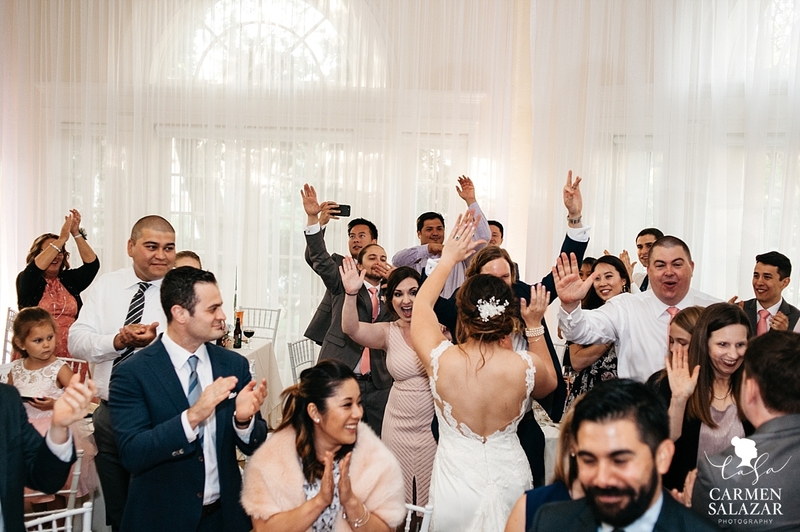 After all those happy tears, everyone was ready to tear up the dance floor and sing a college song or two!! 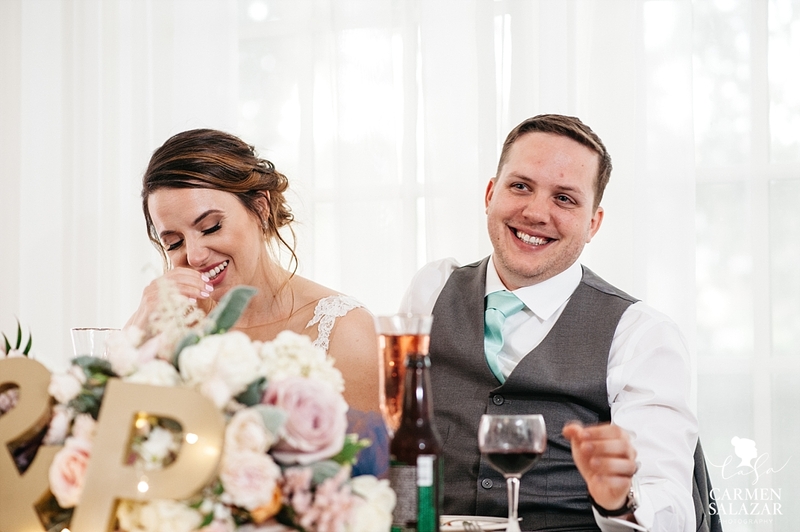 Kaitlin sure is Paul’s #1! 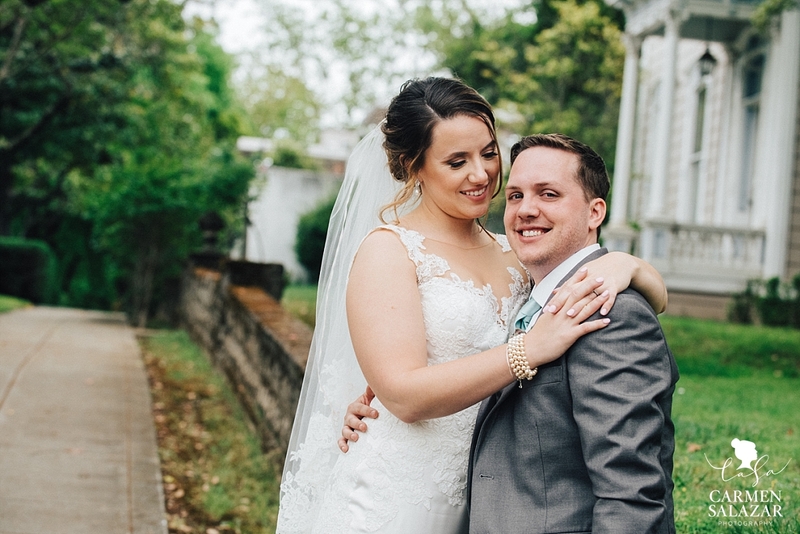 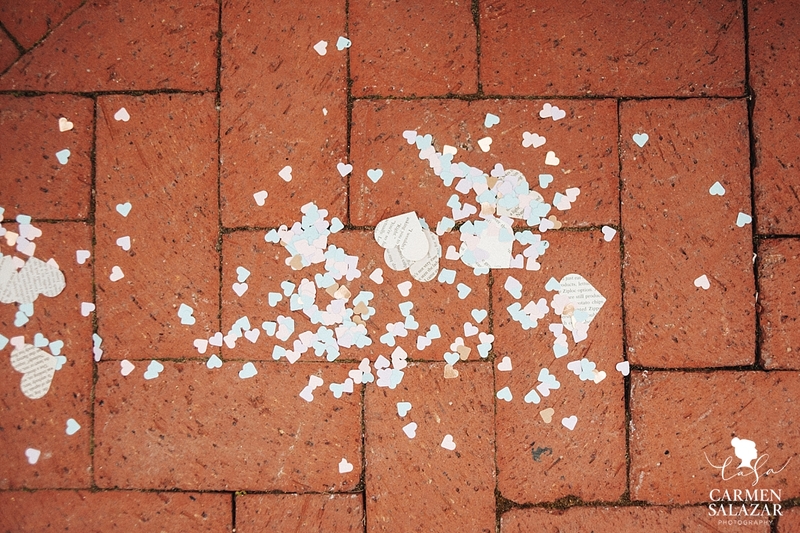 Congratulations to the newylweds — may you always play together and know that family is everything. 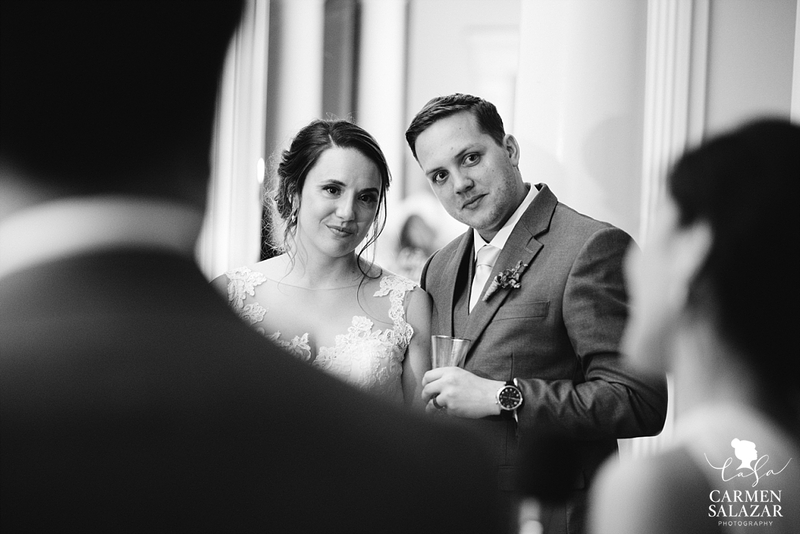 > Next post : Take a peek at our new home!